Clear skies. Low 59F. Winds NE at 10 to 15 mph..
Clear skies. Low 59F. Winds NE at 10 to 15 mph. Fresno County district attorney Elizabeth Egan, at left, joined by Fresno police chief Jerry Dyer, right, announces to the media on March 12, 2013 misdemeanor charges filed against then-28-year-old Leonard Louis Serrato, 24-year-old Aaron Joseph Raymo and 22-year-old Daniel Woodard Baker for their actions in the hazing death of Fresno State student Philip Dhanens on Aug. 31, 2012 at the now-closed Fresno chapter of the Theta Chi fraternity. Philip Dhanens drank a deadly amount of alcohol during the initiation of new members. 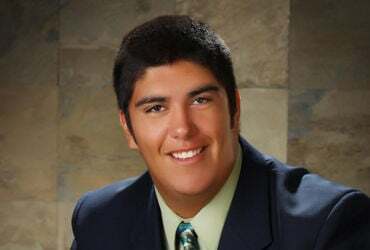 Philip Dhanens died after drinking at a Fresno State fraternity house. The mother of a Fresno State fraternity pledge who died during a night of binge-drinking in 2012 told the two defendants connected with his death Tuesday that she knows they didn’t intend to harm him. But Diane Dhanen of Bakersfield didn’t completely absolve defendants Leonard Louis Serrato, 30, and Aaron Joseph Raymo, 26, both former members of the Theta Chi fraternity at Fresno State. They were with 18-year-old Philip Dhanen the night he died. Superior Court Judge Dennis Peterson agreed. “There is no doubt that both defendants are remorseful,” Peterson said. But Peterson said he also had an obligation to uphold the law and make sure people are held responsible in tragedies such as these. The judge sentenced Serrato to 90 days in the Fresno County Jail, 90 days in the county’s adult offender work program and three years probation. He must also pay a $220 fine. Serrato’s former fraternity brother, Raymo, received a 30-day jail sentence and 90 days in the work program. He will also be on three years probation and must pay a $220 fine. Serrato and Raymo pleaded no contest to a misdemeanor charge of hazing and providing alcohol to a minor causing death. A third defendant, Daniel Woodward Baker, 23, the president of the fraternity, had previously been sentenced. He was given three years probation, 30 days in the adult offender work program and 200 hours of community service. He plead no contest to a single misdemeanor charge of hazing. Dhanen was a fraternity pledge who drank an estimated 37 one-ounce shots of hard liquor. He later died at Saint Agnes Medical Center. The Fresno County Coroner’s office said his blood alcohol level was 0.36, more than four times the legal limit to drive. During her short speech before the court, Diane Dhanen thanked Serrato and Raymo for having the courage and integrity to cooperate with investigators. Dhanen said she never would have imagined she’d be standing in a courtroom discussing her son’s death. She said she misses him everyday. Serrato did not make a statement. Raymo said he can’t change what happened that night, as much as he wanted. “Everyday I think about Philip, everyday,” Raymo said, as he began to cry. Raymo said he has been trying to be more spiritual and through establishing a closer relationship with God, he can find forgiveness. After Dhanen’s death, Theta Chi revoked the chapter’s charter at California State University, Fresno, in November 2012 and the university no longer recognizes the chapter.